Center’s Branson Map with Alternate Colored Routes. At first glance, it appears that the wrong term, “Roads” instead of “Rhoades” was used in connection with the word “Scholars,” but that’s not the case. We are actually referring to “Roads Scholars,” as in making traveling around a more pleasant part of the Branson experience. Does Branson have a lot of traffic during its season? We sure hope so; but the challenges of getting around in that traffic are no worse in Branson than those encountered in most major travel destinations. With a little planning, these challenges can be reduced if not eliminated entirely. Highway 76 is also referred to as “The Branson Strip.” It’s easily Branson’s most traveled road and runs east and west through the entire length of town. With its three block Main Street extension, running east from the intersection of Highway 76 and Business Highway 65, through historic downtown Branson to Branson Landing, Highway 76 extends from Silver Dollar City, on the west, to Branson Landing, and the shoreline of Lake Taneycomo on the east. The majority of Branson’s theatres, including some of its most popular shows, are located on Highway 76. These include, among many others, Legends in Concert, Dixie Stampede, Grand Jubilee, Amazing Pets, Illusionist Rick Thomas, Presleys’ Country Jubilee, Clay Cooper’s Country Express, The Haygoods, Billy Dean In Concert With Jarrett , Ayo starring Voices of Glory, it starring the Hughes Brothers, and SIX. Most of Branson’s major attractions are located on Highway 76, including the Titanic Museum Attraction, The Track Family Fun Parks, Hollywood Wax Museum, Ripley’s Believe It or Not, White Water, the Butterfly Palace and Rainforest Adventure, and many more. One way or another, either because of wanting to or having to, it is a virtual certainty that you will be traveling on Highway 76. The key to doing so efficiently, and avoiding frustration, is to simply keep direct travel on Highway 76 to a minimum during peak travel times, and to use Branson’s Alternate Colored Route System to help you do so. Because it is the main east/west Highway link to and from Branson, and because most of Branson’s theatres, attractions and major shopping areas are on it, Highway 76 is heavily traveled throughout the day. Typically, this causes minimal if any inconvenience except for the peak periods. The traffic generally becomes heavier and more concentrated during two peak periods; one is between approximately 5:30 PM and 8:00 PM when people are trying to eat and get to shows. The other is on Sunday, between about 9:30 AM and 1:00 PM, the time-frame when many people are try to exit Branson at the same time. These periods would be excellent times to use Branson’s Alternate Colored Route System to avoid travel on Highway 76 as much as possible. Exiting and Entering Branson: When exiting Branson, you can avoid the traffic on Highway 76 by getting over to the Red Route, as close to its western junction with Highway 76 as possible, and taking it east to its intersection with Highway 65 from where you can exit north or south. Simply reverse the process when entering Branson. 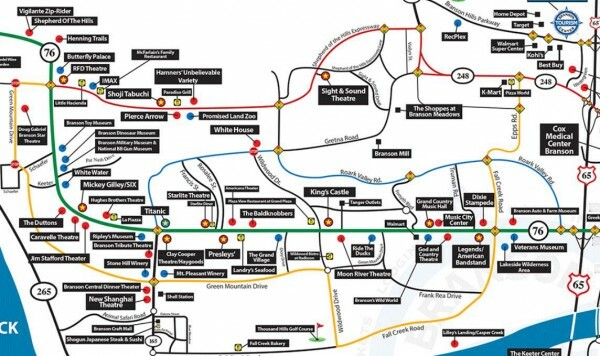 Getting To and From Branson Landing: The Red Route is also an excellent alternate to Highway 76 for getting to and from Branson Landing. Take it east past the Highway 65 junction to the roundabout and go into the Landing from the roundabout. Investing a little time with a map and planning a route to your initial Branson destination, for your daily travels while in Branson, and to your exit from Branson can make your time here more enjoyable. A simple way to do this is to “target” your destination by relating it to Highway 76 or an alternate colored route on a map. This way, you have a point of reference should there be a problem. Unfortunately, many online maps and GPS services ignore Branson’s Alternate Colored Route System. The good news is that, in the vast majority of cases, the maps available online through Branson based businesses and in printed form at many places in Branson, including the Branson Tourism Center, not only show the Alternate Colored Routes, but also a lot of the major shows, attractions, and other things that Branson has to offer, making it extremely easy to target your destination. The Branson Tourism Center’s online map, which can be viewed online or downloaded and printed in PDF format, is one such map. If you have any questions about directions or need information or tickets for any of Branson’s shows and attractions, or if you need lodging arrangements, please feel free to contact the Branson Tourism Center, one of Branson’s largest and most respected vacation planning services, by calling their toll free number 1-800-785-1550 or by visiting www.BransonTourismCenter.com. This entry was posted in Branson, Featured, News on February 15, 2016 by Gary Groman.